This design/build project consisted of a design and construction of a 30,500 gross square foot functional dining facility. The facility is similar to a college or university cafeteria in general function and quality providing receiving, storage, preparation, serving, queuing, dining, dishwashing, and equipment needed for appropriate food service and eating activities. The project provides a 544-seat dining facility, feeds 1,300 trainee solders per meal within 90 minutes, serves as a gathering space for group activities, and accommodates 104 staff members. This dining facility is located within a few feet from an existing 1930’s era barracks building in the old Main Post area. 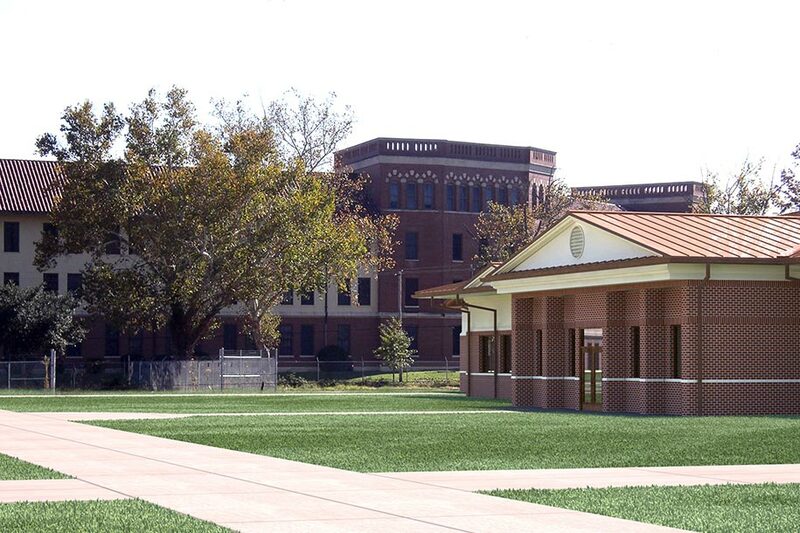 Hussey Gay Bell’s architects met with Ft. Benning’s Historic Preservation Office several times at the onset of the project to ensure the new building was compatible with the surrounding architecture and future facilities proposed for the old Main Post area. 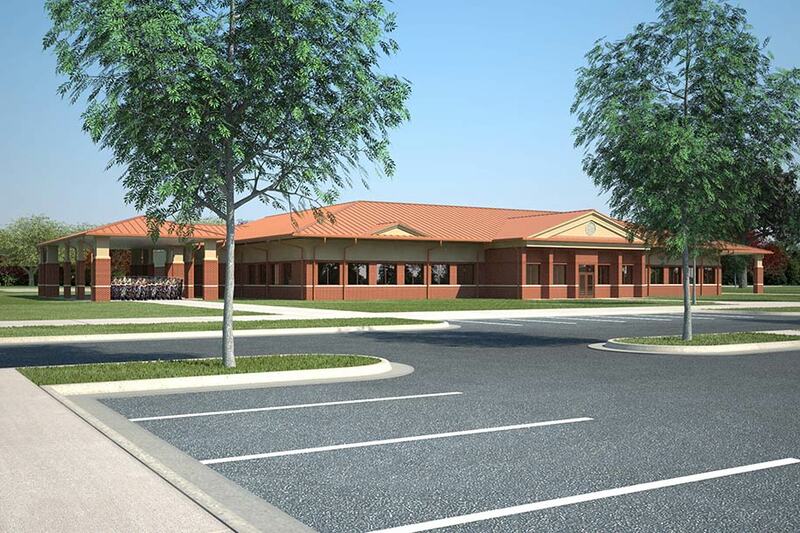 The masonry lower levels and upper-level EIFS accents above, and a standing seam metal roof, provide for an easily maintained exterior while projecting an image consistent with Ft. Benning standards. The D/B team submitted an aggressive construction schedule which included a fast track site design and construction approach. A site polygon provided by Ft. Benning was in error. Hussey Gay Bell developed and submitted a corrected polygon along with the fast track site design. Additionally Hussey Gay Bell held several meetings with Ft. Benning’s Environmental Office. This was necessary due to the fact that Ft. Benning was in the process of revising their Land Disturbance Permit template. Hussey Gay Bell overcame both of these obstacles and submitted and received approval of the site design and permitting package on schedule. This Dining Facility was under construction at the same time as an adjacent construction project by a different D/B team. Hussey Gay Bell coordinated with the adjacent D/B team the site design such as pavement and sidewalk finish grades, clear delineation of project limits, and storm drainage designs where the two projects met. A facility, functional as a dining and gathering space to fully serve over 1,300 trainees per meal, is delivered fast-track within a surrounding historical context.